Easy to Use. Flexible. Powerful. After years of managing event registrations, partners Clifton House and Juan Galvan decided there had to be a better way. In 2001 we founded Looking Cube, and introduced the RegWiz event registration system. 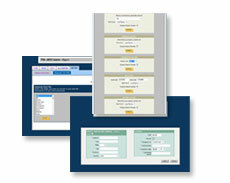 RegWiz is designed to make registration easy and convenient for the attendee. But more importantly, it helps event management streamline the process, and provides all the tools necessary to provide full service registration for any size event. Our modular approach lets us completely customize each step of the registration process to best suit your event's needs. Additionally, as new features and options are developed, they are integrated smoothly into our basic system, so each new system always includes the latest refinements. Often registration is the first experience your customers have with your event. Accordingly, our pre-registration application is built for speed and ease-of-use. Context sensitive help answers any questions, dynamic messages provide important information to your attendees, and “One-Click” registration is available to alumni of past events. On site, we use the same software as during pre-registration, so your staff needs no additional training or instructions. A streamlined entry interface is in place to quickly bring temporary onsite staff up to speed. Our high-speed badge printers can encode high-density barcodes for badge scanning. Custom modules allow for self-registration, mass badge printing, even do it yourself packages as well as a host of other features.